All home medical equipment manufacturers, clinicians and providers want to offer the most clinically effective support surfaces for the end user. 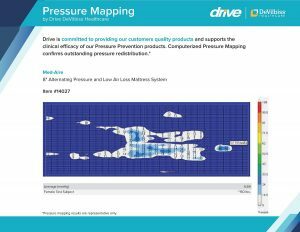 Whether developing a new product, choosing a support surface for a patient or addressing issues with a current support surface, pressure mapping can be a valuable tool in ensuring effective clinical care and comfort for the patient. Pressure Mapping is one of many tools used to ensure pressure distribution and the efficacy of a support surface. This computerized tool is used by placing a thin, sensor pad on a wheelchair seat or mattress surface. When a patient sits or lies on the pad, the software generates a digital reading that appears on the computer screen, using colors, numbers and an image of the patient. Typically, blue-colored areas of the map indicate lower areas of pressure; whereas, the red areas indicate higher-pressure areas, the areas of concern. The numbers indicate pressure in mmHg and correspond to the colors. When these higher-pressure areas are identified, the clinician can work with the patient to head off potential issues or determine the cause of any discomfort or possible pressure injuries. For example, a clinician may find that a wheelchair patient presents with a stage 2 pressure injury, where the skin has broken open, worn away and a tender, painful ulcer has formed. By assessing the patient’s skin and mapping the pressure distribution, the clinician may find that by equipping the wheelchair with armrests, a considerable amount of weight can be taken off the patient’s sitting bones. By eliminating the high pressure on that area, it is possible for the patient’s pressure injury to significantly improve or even heal altogether. Although the same cushion or mattress may show a very different pressure mapping report between various patients, it is one very important tool in assessing a patient’s situation and ultimately improving their quality of life. Let us show you how our pressure mapping technology has led us to develop some of the most clinically efficacious support surfaces on the market. Contact your Drive DeVilbiss Sales Representative today!